What is OOM? It happens when the machines run into very low memory somehow. The OS doesn’t want to run into kernel panic. So as a self-protection, the OS will choose one victim. Usually the process using the most RAM. Kill it and release the memory resource. How to confirm an OOM issue? When it happens, the system log will have entries of “Killed process”. Thus, we can use grep it like this: dmesg -T | grep -C 5 -i ‘killed process’. List all processes, before killing the victim. So use “grep $pid” to find out which process gets killed. In the above example, we know some “java” program has been killed. Well, I admit, it’s not crystal clear. The good thing is that OOM only happens with processes using a huge amount of RAM. So in reality, we will always be able to guess which process gets killed. OOM Exclusion: show mercy to my critical processes. OS chooses victim by scoring all processes. We can explicitly lower the score of certain processes. So they might survive, while some other less critical processes are sacrificed. This could buy us more time before things get worse. But remember there is no guarantee that your processes will be safe. The machines may run into very low RAM, and the OS might need to sacrifice more processes, yours included. Honestly speaking, I think you will have little room to avoid OOM, if there is not enough available RAM in your servers. 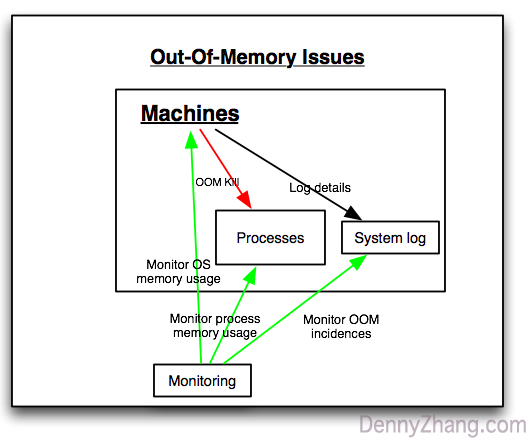 Monitor memory usage of critical processes. Usually OOM happens only if certain heavy-weight processes keep taking more and more RAM. See how to monitor process memory usage: checkprocmem.sh. Monitor system log to detect OOM incidence. We can keep polling system logs, and get alerted when OOM does happens. Currently I don’t have scripts to check this. If it turns out to be a strong requirement, I’d be happy to implement one and open source it. So leave me comments below. Let me hear your voice! The third one of monitoring system log to detect oom seems to be a great idea. Is it that syslog file in var/log/syslog alerts or displays something apriori that system is running out of memory before killing the process or before invoking oom killer? Is it open-sourced?